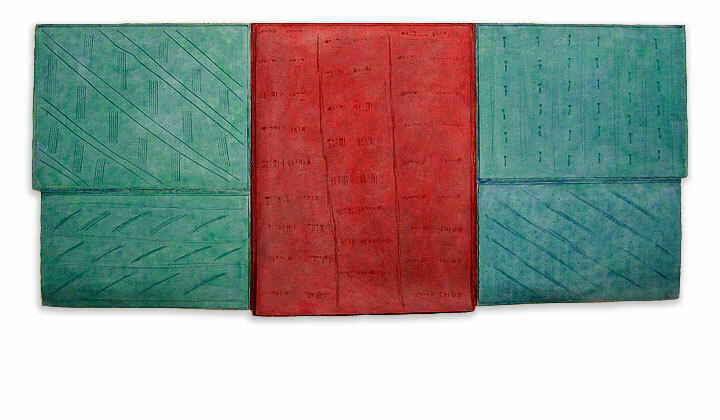 The paper pieces, paint powders or acrylic on sewn and marked paper was made between 1976 and 1981. The three paintings included here from that period are acrylic wash, acrylic gel, and glue on sewn canvas. The paper pieces are sewn together with hot pressed (smooth) paper on the bottom and cold press (rough textured paper) on the top. Each top rough section is scored with wood cutting tools in patterns that are shorthand for the following: evergreen trees standing in rows, planted vegetables in rows in a garden, and animal tracks on the soil. The scoring of the paper surface causes the acrylic wash, when applied, to stand out darker than the surrounding unmarked paper. Later pieces from 1979 are inspired by window shapes from subway cars on the E & A lines, and house windows that have shutters. The paintings were canvas sewn together overlaid on more canvas and stretched on painting stretchers. The marks were made by applying lines of glue, letting the glue dry and then painting the surface with acrylic wash. The middle panels were painted first, transparent gel is applied, after that another coat of acrylic paint was applied and a palette knife was used to incise marks into the get to reveal the base color underneath. Markings are inspired by evergreen trees, planted vegetable rows, and animal tracks.